When Cancer and Aquarius soul mates enter into a romantic relationship together it will be a match of the opposites. These signs have a few zodiac traits in common, but for the most part they spend their time looking at the world in drastically different ways from how the other views their surroundings. This Cancer and Aquarius love compatibility will only be successful if these two signs learn to use their differences together, as if they are trying to balance each other out. If they get too focused on what they don’t have in common rather than what they do, though, this Cancer Aquarius relationship could not last long. Cancer men and women are both emotional creatures. They tend to want to talk about their feelings with people who they trust, rather than keeping everything bottled up inside of them. Both the men and women of this sign are also prone to uncontrollable mood swings which can sometimes cause discord within their relationships. Cancer is also a socialite of a sign. They love to get out and meet people, even if they might be shy at first. This sign is quick to warm up to people who they like. They are great at keeping friends because of their friendly and peaceful disposition. The Crab is also a dependable sign; they are always there for the people who they care about. This sign is also loyal to their romantic interests. They understand how terrible cheating is, and they would never wish it upon anyone, or do it to someone who they care about. They will be absolutely devastated if they are cheated on as well. The Aquarius zodiac sign is independent, intelligent, and creative. This sign needs to be able to express themselves if they are to be happy. They cannot have their creativity stifled and still be able to function normally. While not everyone in this sign is an artist, they still use their ideas in creative ways, or ways that others might not think of. They take pride in this ability. This sign also craves knowledge, in whatever form it is presented. While this sign can sit around and read books for hours, they also would love to take a trip to learn about a culture in person. This sign is also likely to use the skills that they learn instead of simply storing knowledge. This sign makes a great teacher. However, this sign is nowhere near as emotional as Cancer, so they might have problems relating to their intense feelings. They will do their best to improve the Cancer Aquarius compatibility, as they tend to have successful social relationships from all walks of life. As you can see, in a Cancer Aquarius friendship, both these signs have many traits that will be able to fit together like pieces of a puzzle. Let’s look at some of the pros of the Cancer and Aquarius being in love. Aquarius is more attracted to people who are wise and still have room for more knowledge. The Cancer person’s emotional disposition can be a disadvantage to much of their life, but in this case it also helps to make them more sensitive to the world around them, allowing them to have a deeper response than many other signs would. Aquarians will be intrigued by this trait, and this could even be what interests them in dating a Cancer in the first place. In this Cancer and Aquarius compatibility, the Cancerian will also be able to teach the Water Bearer how to learn from their own personal emotions instead of just learning from others. They can help them to slow down and appreciate the little things in life instead of always being focused on the big picture. In a Cancer Aquarius marriage, the Crab can show Aquarius the more delicate workings of the world and they can also teach them how to better understand their emotions within themselves. All these teachings will be able to make the Aquarian into a more affectionate lover at the end of the day. Aquarius won’t be the only one learning in this relationship though. Cancer will love to try to figure out what is going on in the mysterious head of their partner. Once the Aquarius is in tune with their emotions, they will still not be fond of sharing them, which will make the Crab wonder and want to know all the more about their partner. Cancerians ask a lot of questions rather than to wait for the answer to come to light on it’s own time. In the Cancer Aquarius compatibility, both these two signs think very differently, as Aquarius would rather try to figure out things on their own rather than to ask questions about their partner. They love the thrill of learning something all on their own. Cancer will sometimes want to join their partner when they are trying to learn something as well. They also have strong traditional values that will help to guide them within their relationships. If they stick to their values it should be able to make their side of the relationship much easier for them. Their Aquarius partner can balance out this trait in the Cancer and Aquarius compatibility because of how outgoing and free they are. They don’t let fate or guidelines dictate their lifestyle. 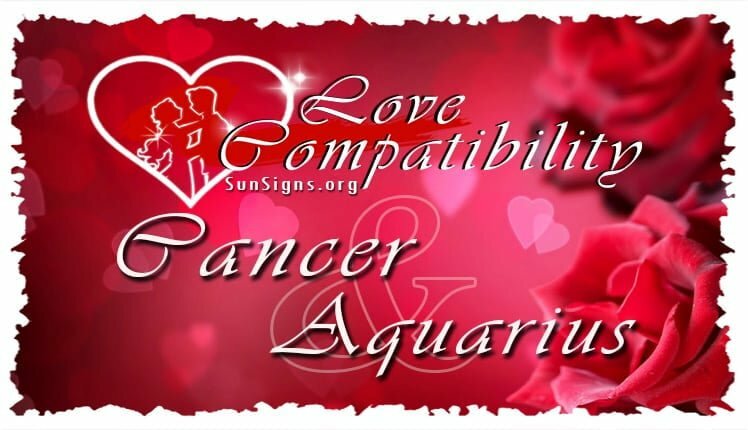 Even though these signs have a lot going for them, they also have a fair amount of differences that can easily come between the Cancer and Aquarius love compatibility. Now let’s look at some of the cons that can affect a romantic Cancer and Aquarius relationship. Cancer is a highly stable sign, except for emotionally, and they will want to be with someone who is also stable. Sadly, Aquarius is not even close to being as stable as the crab. They are a wandering sign. They want to see as much of the world as they can, and they are not likely to stay in one place for too long. While Cancer is flexible and willing to go with Aquarius if they are in love, the Aquarian might think that their lover will slow them down or get in the way. Sometimes an Aquarius would rather dump a Cancer, rather than adventure with them. Even if they don’t travel, they are still not likely to spend much of their time at home with their partner or their children. They would rather be out of the house working on a hobby or at the library, learning. (Reasons you can be dumped in a relationship). The Cancerian will hate this trait about their partner, as it in no way fits to their traditional values. At the same time, the Water Bearer is not likely to hold an average full-time job. They would rather be unemployed than being employed but doing something that they dislike. As there are not a lot of jobs that only entitle travel and adventure, it is not likely that this sign will be able to find a desk job which they enjoy. This can make this couple’s financial situation unstable, which will also make the Cancer in the relationship upset as well as uncomfortable. Complications can also occur within the Cancer Aquarius love compatibility when it comes to these two signs’ very different ways of processing their individual emotions. Cancer understands their own feelings, as well as others, and they will want to talk about their feelings. At times, Aquarius will feel uncomfortable when their lover needs to vent to them, especially if it is about a past love or something that is wrong within their relationship. While Aquarius will want to help, they often don’t know how to express their feelings in words, or they simply may not have the same feelings as the crab. This can complicate things sexually between the Cancer and Aquarius in bed, as well as making them move away from each other and break up. The Cancer Aquarius love compatibility have a lot going for them, but they also have a lot of differences that can get in the way of their relationship. Cancer needs to learn to be more open about Aquarius needing their independence if they don’t want to scare them away. On the other hand, Aquarius needs to learn to get more in touch with their own emotions, or at least learn how to help with Cancer’s emotions so that they can better communicate with each other. This relationship can work, but only if these two both put in some effort.